For some reason -- let's say it's because JS somehow comes home with a duck or two every couple of months -- we seem to be having more duck at home. I guess that very first duck opened the floodgates. From ducks come duck carcasses, and from duck carcasses come duck stock. We had some duck stock sitting around in the refrigerator. Further rummaging around yielded these other items: there's the duck stock, portobello mushrooms, Swiss chard, bacon, Parmigiano-Reggiano. . .
And so, we decided to make risotto. With bacon. And duck fat. 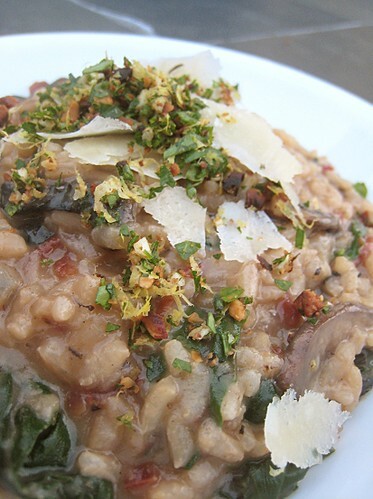 Oh yeah, this is a dual-fat risotto! 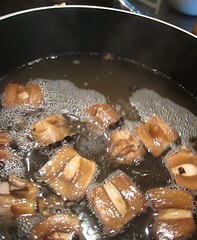 Before I started the risotto, I started heating the duck stock. I threw in the stems from the portobellos. 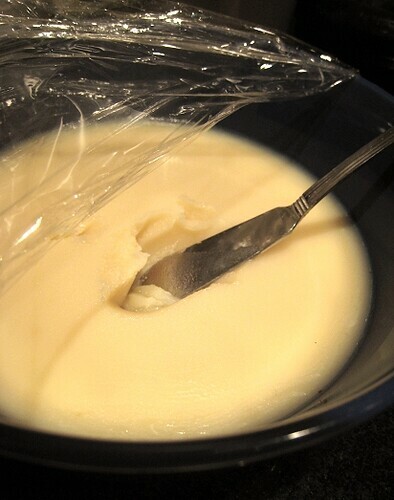 The most important thing is this step is to render out some bacon fat. 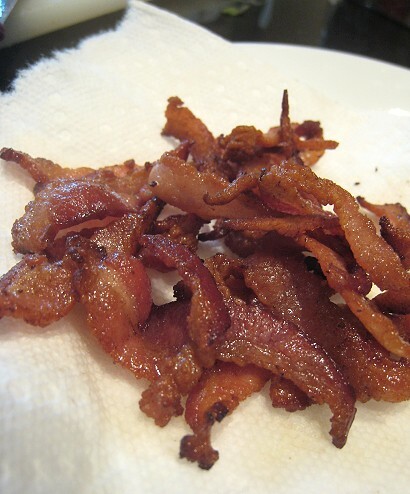 Of course, I kept those crisp bacon pieces and set them aside. I sautéed the portobellos and the chard separately. In the residual bacon fat in the pan, I sautéed the sliced portobellos first and set those aside. For the swiss chard, I decided to keep the stems and so had to add them to the pan first. When the stems were just about soft, I added the greens and cooked until they were just wilted. 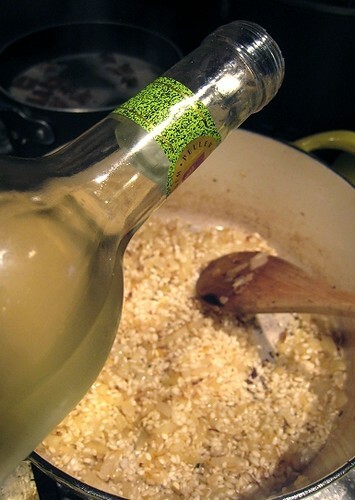 Time for making the risotto! I used the standard risotto method to make this dish. I sautéed some onions and garlic in some duck fat until the onions had softened. I then added the arborio rice. I let that cook until the rice was toasted. I added a touch of white wine, let that cook for a bit, then proceeded with the ladling of the duck stock. You know how it goes. Add stock and stir. When the rice has absorbed most of the liquid, repeat. 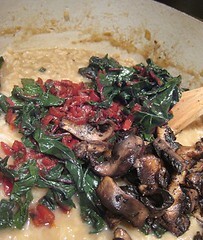 When the rice was more or less done, I stirred in the chard and mushrooms. I finished the whole thing off with some butter and Parmigiano-Reggiano. 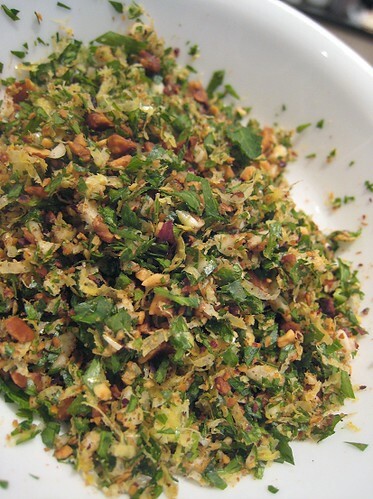 Oh, remember our hazelnut gremolata? There it is again. It has hazelnuts, parsley, lemon zest, garlic and salt. This dish was what we originally made the gremolata for. 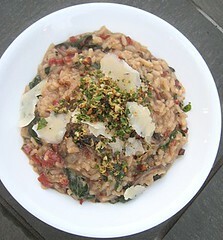 I topped each serving of duck stock risotto with the hazelnut gremolata and some shaved Parmigiano. Oh, you're wondering about those crispy bacon pieces? Well, by the time the risotto was done, all the bacon had been snatched up and nibbled on by other people. I didn't even get to eat a piece... well, maybe two. Although, I do wish the color was cleaner and lighter, and the overall look was not too "busy". 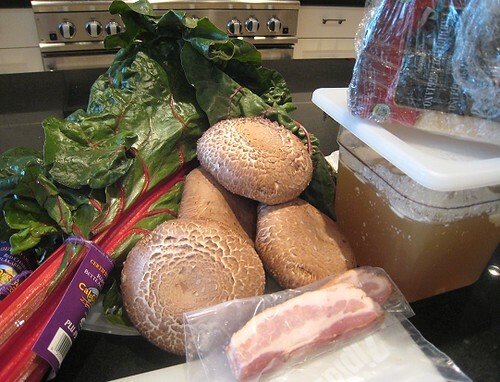 But, I didn't want to get rid of those red chard stems, nor did I think I had to remove the gills from the portobellos. I also really wanted the hazelnut gremolata with my dish. 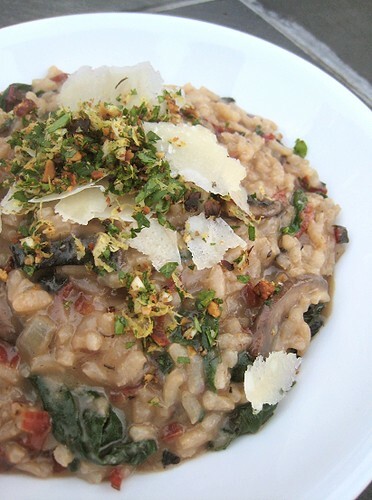 The components of this risotto went really well together. The duck stock provided the requisite depth of flavor, the portobello mushrooms were nice and meaty, and the chard was just plain good. With all the umami going on, the hazelnut gremolata with its bright citrus notes and pungent spikes, not to mention the texture contrasted provided by the roast hazelnut pieces, just put this over the top. Sounds fantastic! Wish I had some duck stock. I do have duck fat, however... maybe I'll make risotto this weekend. Thanks! 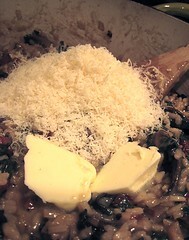 I love the photo of the butter and cheese about to be stirred into the risotto. Having made risotto many times before I know from that photo how delicious the room is about to smell and how glorious the texture is about to become as the butter and cheese melt into the rice.